You may be one of the many who is about to snap if you hear one more carol. After spending day and night listening to Christmas carols everywhere you have gone for the past three and a half weeks following Thanksgiving you can thankfully turn the sound off when you are using Xmas Tree. The app operates with a bare minimum of choices and options. You get to decide whether you will be decorating in or outdoors, if you want a star on the tree or not, and whether there will be Christmas lights wrapped around the tree. You can decorate inside a cozy, candlelit room, or outside on the snow-covered tundra of the North Pole, or in the foreground of a massive volcano. For each of the three scenes, the tree has a different look including, naked, covered in snow, or covered in white and pink flowers. At the bottom of the screen are the ornaments that you can drag onto the tree in any order you want. The ornaments can be swapped out at any time for presents, other styles of ornaments, candy canes, bows, owls, snowflakes, snowmen, reindeer, basically the works. 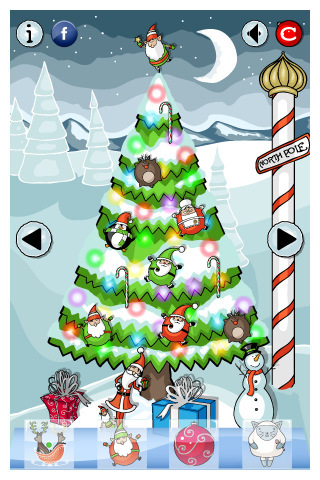 You can only have 4 options at a time at the bottom of the Christmas tree screen so if you want to mix it up you can toggle back to the decoration page and switch the items around. Xmas Tree Decorator definitely grew on me. It is all part of the massive holiday spirit and it can be fun to decorate a tree and show it off. When you are done constructing your tree you can share it with friends on Facebook. 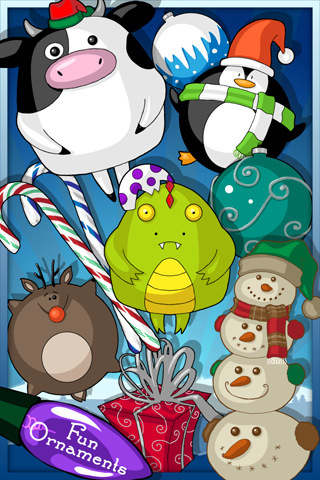 AppSafari review of Xmas Tree Decorator was written by Vanessa Paszterko on December 21st, 2010 and categorized under App Store, Art, Fun. Page viewed 3631 times, 1 so far today. Need help on using these apps? Please read the Help Page.